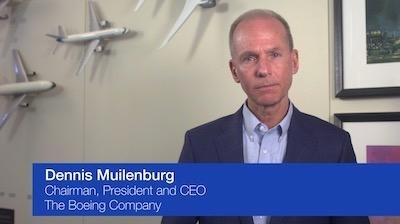 Boeing CEO Dennis Muilenburg has released and open letter to the aviation industry and airline passengers seeking to reassure them about the viability of the company's 737 MAX airplanes. "We know lives depend on the work we do, and our teams embrace that responsibility with a deep sense of commitment every day. Our purpose at Boeing is to bring family, friends and loved ones together with our commercial airplanes -- safely. The tragic losses of Ethiopian Airlines Flight 302 and Lion Air Flight 610 affect us all, uniting people and nations in shared grief for all those in mourning. Our hearts are heavy, and we continue to extend our deepest sympathies to the loved ones of the passengers and crew on board," Muilenburg says in the letter. "Safety is at the core of who we are at Boeing, and ensuring safe and reliable travel on our airplanes is an enduring value and our absolute commitment to everyone. This overarching focus on safety spans and binds together our entire global aerospace industry and communities. We're united with our airline customers, international regulators and government authorities in our efforts to support the most recent investigation, understand the facts of what happened and help prevent future tragedies. Based on facts from the Lion Air Flight 610 accident and emerging data as it becomes available from the Ethiopian Airlines Flight 302 accident, we're taking actions to fully ensure the safety of the 737 MAX. We also understand and regret the challenges for our customers and the flying public caused by the fleet's grounding. "Work is progressing thoroughly and rapidly to learn more about the Ethiopian Airlines accident and understand the information from the airplane's cockpit voice and flight data recorders. Our team is on-site with investigators to support the investigation and provide technical expertise. The Ethiopia Accident Investigation Bureau will determine when and how it's appropriate to release additional details. "Boeing has been in the business of aviation safety for more than 100 years, and we'll continue providing the best products, training and support to our global airline customers and pilots. This is an ongoing and relentless commitment to make safe airplanes even safer. Soon we'll release a software update and related pilot training for the 737 MAX that will address concerns discovered in the aftermath of the Lion Air Flight 610 accident. We've been working in full cooperation with the U.S. Federal Aviation Administration, the Department of Transportation and the National Transportation Safety Board on all issues relating to both the Lion Air and the Ethiopian Airlines accidents since the Lion Air accident occurred in October last year. "Our entire team is devoted to the quality and safety of the aircraft we design, produce and support. I've dedicated my entire career to Boeing, working shoulder to shoulder with our amazing people and customers for more than three decades, and I personally share their deep sense of commitment. Recently, I spent time with our team members at our 737 production facility in Renton, Wash., and once again saw firsthand the pride our people feel in their work and the pain we're all experiencing in light of these tragedies. The importance of our work demands the utmost integrity and excellence -- that's what I see in our team, and we'll never rest in pursuit of it. "Our mission is to connect people and nations, protect freedom, explore our world and the vastness of space, and inspire the next generation of aerospace dreamers and doers -- and we'll fulfill that mission only by upholding and living our values. That's what safety means to us. Together, we'll keep working to earn and keep the trust people have placed in Boeing."